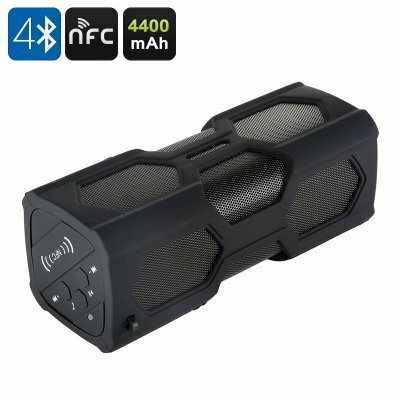 Successfully Added Portable Stereo Bluetooth 4.0 Speaker "Panther" - Waterproof, Shockproof, 4400mAh Power Bank, NFC to your Shopping Cart. This highly portable Bluetooth 4.0 speaker is known as the "Panther" and comes with an IPX4 rating and a tough rubberized outer shell to help protect it from bumps and drops. This sturdy speaker is therefore well built for an outdoor lifestyle and can accompany you on camping trips, days out trekking or holidays in the great outdoors. With a large capacity 4400mAh battery this powerful speaker can also double as a power charger for your phone or music player and makes this multi-function speaker a real winner for weekends away from the comfort of electricity. With Bluetooth 4.0 is quick and easy to synchronizer this speaker with your phone, tablet or other portable device and if they feature NFC then they can be reconnected at any time by simply brining the two devices together. Support for A2DP and AVRCP means a stronger and more stable connection can be established to bring stereo quality sound so the two 3 watt speakers will bring a solid performance, you will also be able to answer incoming calls on your phone directly from the speaker and utilize its hand free options when paired with your mobile. This fantastic Bluetooth stereo speaker comes with a 12 months warranty. Brought to you by the leader in electronic devices as well as wholesale Bluetooth speakers and headsets, Chinavasion..